He was a comedian for the times: a man whose sense of humor was considered by some to be out-of-bounds, harsh and politically incorrect. 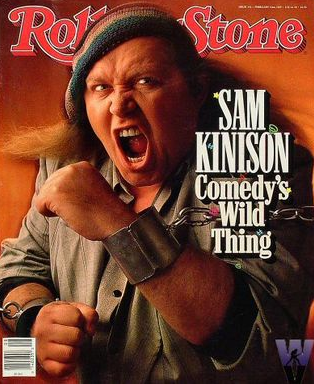 For others, Sam Kinison was known as the “Wild Thing of Comedy" with a worldwide reputation as a party animal. 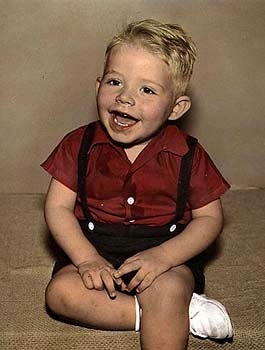 Samuel Burl Kinison was born on December 8, 1953 to Samuel E. and Marie Kinison and grew up in Peoria, Illinois. 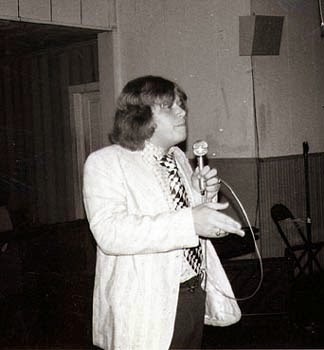 Kinison’s father was a Pentecostal minister who continually moved from church to church. 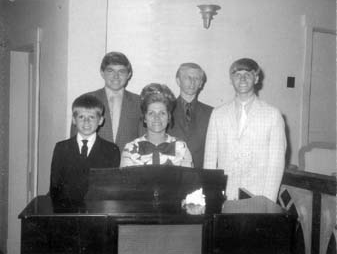 Sam was the youngest of four brothers, all who followed in their father’s footsteps and became Pentecostal preachers. 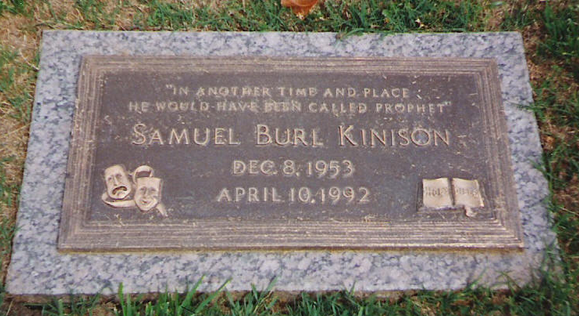 Kinison began his fire and brimstone style of preaching when he was 17 and continued until he was 24. It took a divorce to make him realize that he was not cut out for the ministry, but would be much happier as a stand up comedian. He took to the stage in Houston, Texas and then moved on to L.A. where he developed a cocaine habit that would plague him most of his life. In the summer of 1985, Kinison got his big break on HBO’s Rodney Dangerfield’s Ninth Annual Young Comedians Special. His irreverent style and screaming outbursts on religion, relationships and drugs was always punctuated with his primal scream. Kinison’s brand of comedy was more intense and in-your-face than most comedians were willing to go, but Sam didn’t appear to care if the audience liked him or not, which is why audience’s loved him. Kinison had appeared in several films, television specials, and MTV videos, and had been a guest on “Late Night with David Letterman” and a host for “Saturday Night Live.” He also appeared on the cover of Rolling Stone Magazine. Kinison was married three times; the third marriage had taken place just six days before his death. Most of his stand up material about relationships came from the ups and downs of his first two marriages. Kinison had just reached the peak of his celebrity when his life was cut short. 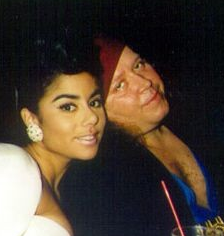 On April 10, 1992, Kinison and his new wife, Milika Sourir, were headed from California to Laughlin, Nevada where he was scheduled to perform at a sold-out show. 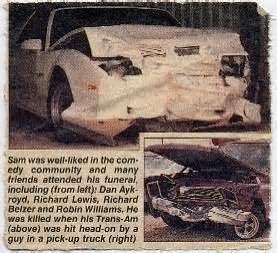 Kinison was driving on U.S. Route 95 when his 1989 Trans Am was struck head-on by a pick-up driven by 17-year-old Troy Pierson, who reportedly had been drinking. 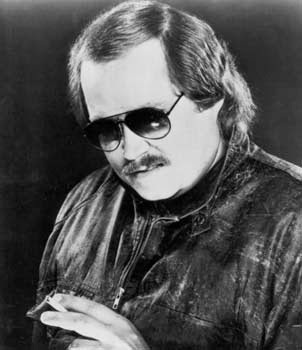 Kinison died within moments of the collision. According to his brother, Bill who was following behind Kinison’s car with a van-load of equipment, Sam didn’t appear to be seriously hurt: he was able to get out of the car and lie down on the pavement. Then in what appeared to bystanders as a conversation with someone, Sam began asking, "Why now? I don't want to die. Why?" After a few seconds Kinison was heard to reply, “Okay, okay, okay …” He died moments later. 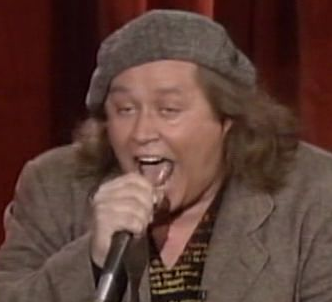 Sam Kinison was 38 years old. He is buried at Memorial Park Cemetery in Tulsa, Oklahoma. On his grave marker is the inscription, "In another time and place he would have been called prophet."